New year, new me bullet journal spreads. 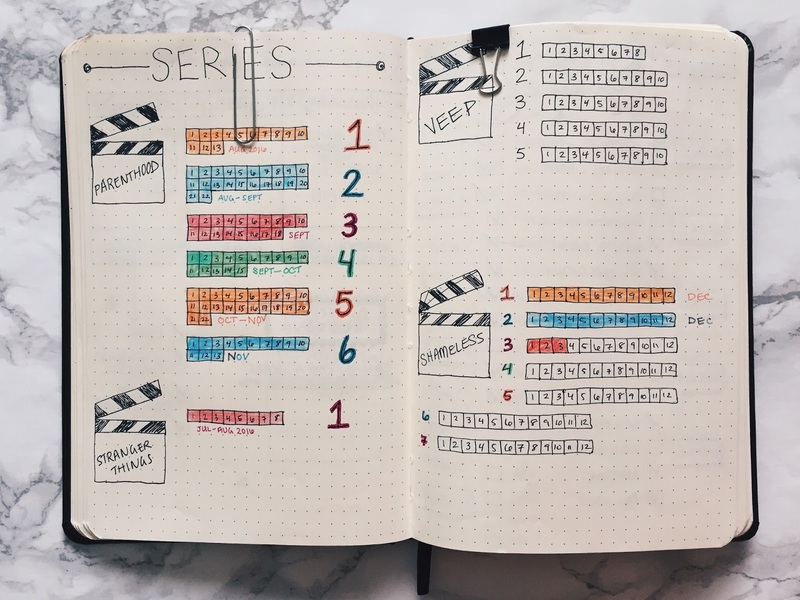 If you aren't familiar with bullet journaling, it's a great method for organization nerds. I like it because I can simultaneously be organized and creative. I wrote two other posts about it, on the materials I use and my first pages, and then an update on new things I was trying out. Now, after about eight months, I'm still using the same materials, a Rhodia dotted-page webnotebook and Sharpie pens. As you can tell, the journal is getting pretty full, which makes me feel weirdly accomplished and proud for sticking with it. When the time comes to get a new one, I'll probably stick with Rhodia. It's been working really well for me; it's sturdy, and the pages don't have any bleed or show-through. My yearly spread is staying the same as last year. I found both pages to be helpful the last time around, and there isn't anything else I could think of that I'd want to track on a yearly level. If you're a big reader, or if one of your resolutions for the year is to read more books, this is a fun layout to play around with. I log all of the books I've read over the year, though I've also seen people track what books they want to read. Of course, money is always a good thing to keep tabs on. The money I spend and the money I save per month are each logged in bar graphs, which I find to be the most helpful in easily recognizing when I'm spending more than usual. My monthly pages are always my favorite. They definitely help me track my progress in different areas on both a daily and monthly basis at the same time. On the left side, I'm keeping my monthly overview, but now I have two calendars – one for my personal life and one for my blog. As usual, the personal-life calendar includes any upcoming events, plans, or appointments. As for the blog calendar, this is actually my first time trying it out, but I already feel like it's making a difference. Since I can now physically see how many posts or ideas I'm dealing with for the month, and how close or far apart to schedule them, I feel more organized and productive. On the right side are my habit trackers (still). In my last bullet journal post, I tried out a horizontal layout, but I only ended up using it that one time. The mini calendars work much better for me. It's easier to see how many days, majority or not, each habit occurred. The weekly spread is the one that I end up changing the most. It all depends on where I want my focus to be. I've been using this layout for the past couple of months. It's a bit different than the others that I've used. Currently, my focus is more on productivity. I no longer include the "happy things" section or a quote. While I liked those little aspects for positivity, I wanted more space for other things. My focus shifted. (Plus, I'm using a new planner as a gratitude journal, so I am still keeping track of the good things.) I also decided to leave off the weekly habit trackers, so they are all in one spot, in the monthly spread only. Daily Tasks. Each day, I jot down a few things that I accomplished as part of my Done list, as well as the day's workout, if I went to the gym. Currently Reading. There's no real point to this except that I like reading, and filling in progress bars can be fun. Meals. I started including this section to help me plan out my lunches for the week. Do I have enough food on hand to feed myself at work? Will I have to cook? Go shopping? Things To Do. Self-explanatory. Anything that has to be done that week. Blog Work. Once again, tasks to do that week that are blog-related. Take photos, write a post, send an email. Those are the pages that I've been continuing to work on, but the cool thing about bullet journaling, as nerdy as it is, is that it can be whatever you want it to be. And what better time to start getting your stuff organized than the start of a new year?